The Ozarks is in the middle of a breezy and quite warm weather pattern which all changes this weekend. It’s toasty for this time of year! I’m forecasting highs close to ninety both today and on Friday. This will be accompanied by a healthy breezy out of the south and higher humidity. 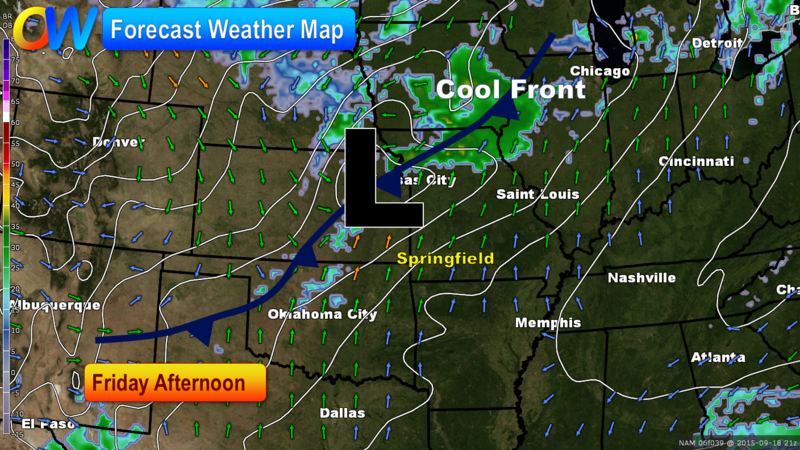 The next weather-maker is a cold front which will pass through the Ozarks very early on Saturday. 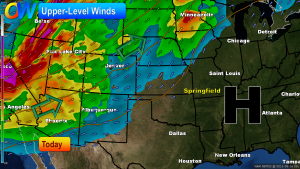 The showers and storms expected with this front will be here on Friday night. I hoping that Friday night outdoor activities will be o.k. as the rain should wait until later in the evening. A few showers may linger early on Saturday and another disturbance may fire some showers again on Sunday. The weekend will definitely be cooler! I’m looking for highs back in the seventies on Saturday and Sunday with lows dipping into the fifties. Under a persistent south wind, temperatures continue to climb this week with Thursday and Friday being the hottest days. The humidity is back too and this will slowly rise through the end of the week as well. 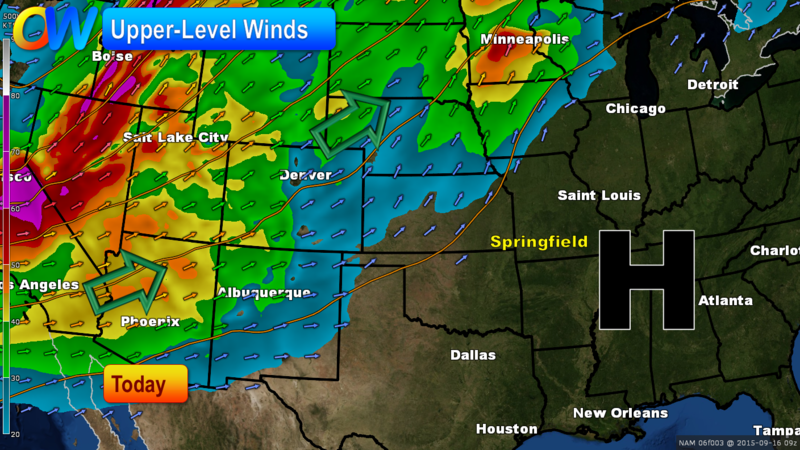 The upper level winds are weak with high pressure near the Ozarks. Out west, a large storm with stronger wind is developing. This system will bring us our next weather change starting late Friday. Today, there is a very small chance for a shower or some thunder. But the greater chance for rain comes when out next cool front drops in late Friday and Saturday. 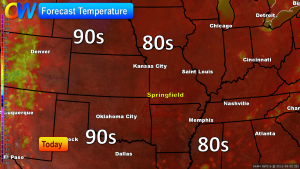 The temperature is rising in the Ozarks later this week but today readings will be nice for the season. 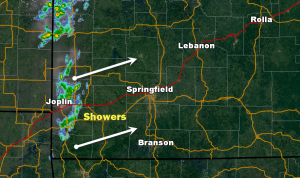 Early today, some widely scattered showers will blow through the Ozarks very quickly. The rest of the day looks dry with slightly cooler than average temperatures for the season. A persistent pattern of southerly winds will slowly cause both the humidity and temperatures to rise this week. I’m looking for highs back in the upper eighties by weeks’ end. A front swings on Friday with a chance for showers and storms. This will cool the temperatures back down for the weekend. After a fantastic fall-like weekend, rain showers and some thunder will be possible today. The rain chance is not associated with another cool front but with a weak disturbance aloft. This means temperatures will stay warmer this week. In fact, a very consistent pattern featuring a southerly breeze will lock in all of this week. I see highs in the middle and even upper eighties by week’s end. The well-advertised push of fall-like air begins today. 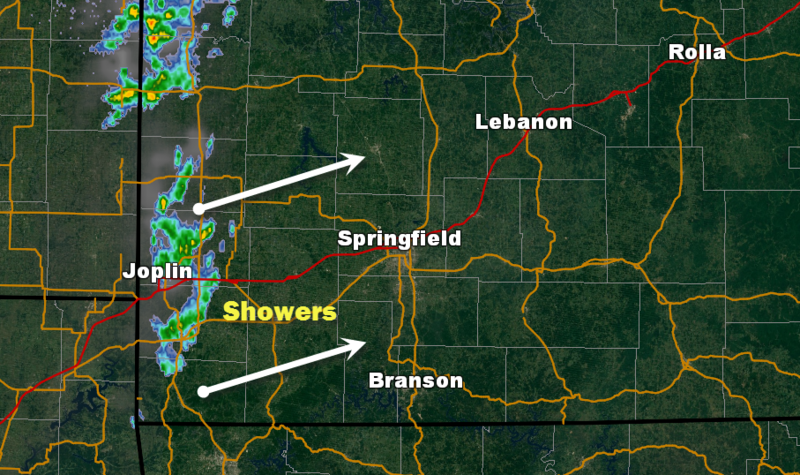 Rounds of rain and thunder moved through the Ozarks last night producing gusty winds and some nice downpours. The cool front diving the rain is moving through the area early today. For the next several days, cool morning and mild afternoons will be the rule. I am forecasting lows to drop into the forties on both Saturday and Sunday morning. On Saturday, our high temperature will probably stay below 70°! It’s a dry forecast lasting into early next week. Nice soaking rains kicked in yesterday over most of the Ozarks as a move toward much cooler weather is underway. 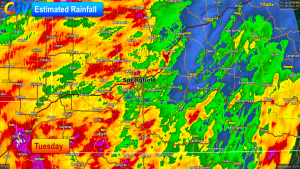 Springfield’s official rain totals was 1.47″ on Tuesday. Areas of McDonald, Barry and Dade Counties picked up 2-4″ where minor flooding was an issue. The rain puts us ahead of average for the month of September. 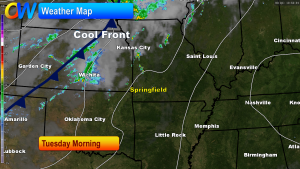 A cool front will finish pushing through the Ozarks today. One batch of more steady rain will leave the area this morning. Additional scattered showers and storms will be possible later today. It will be cooler for the rest of the forecast. Highs today and Thursday will stop right around eighty. On Friday, another cool front drops readings even more. Highs will stay in the sixties on Saturday with sunshine! By Sunday morning, I’m forecasting low temperatures to drop solidly into the forties, real autumnal air! A shift in the weather pattern starts today as rain chances improve followed by cooler temperatures. 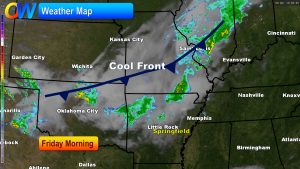 A cool front is in Kansas early today. 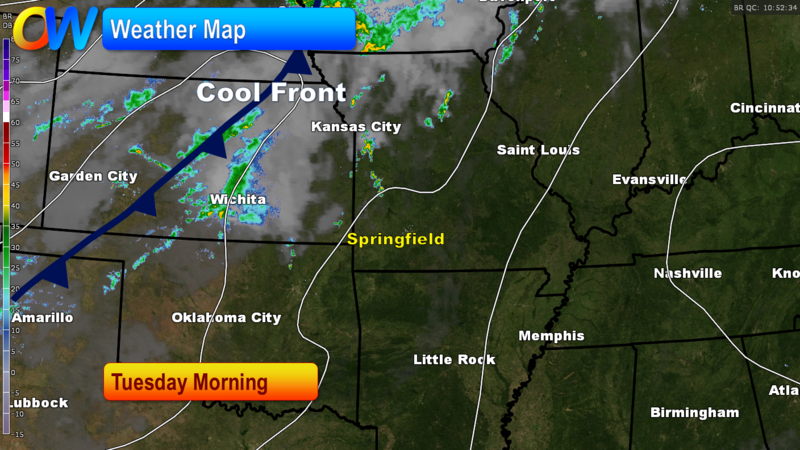 This front will make slow but steady progress into Missouri by later today. 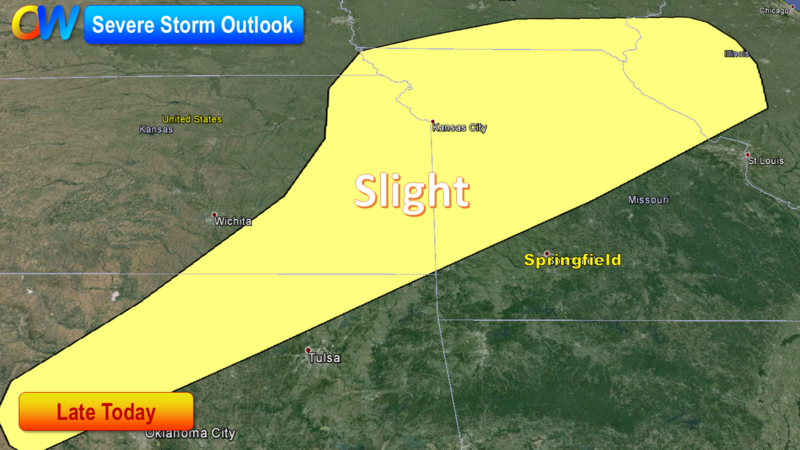 It is the reason that showers and storms will be on the increase over the Ozarks later today and early on Wednesday. Rain chances look healthy with 1-2″ totals common over the area. 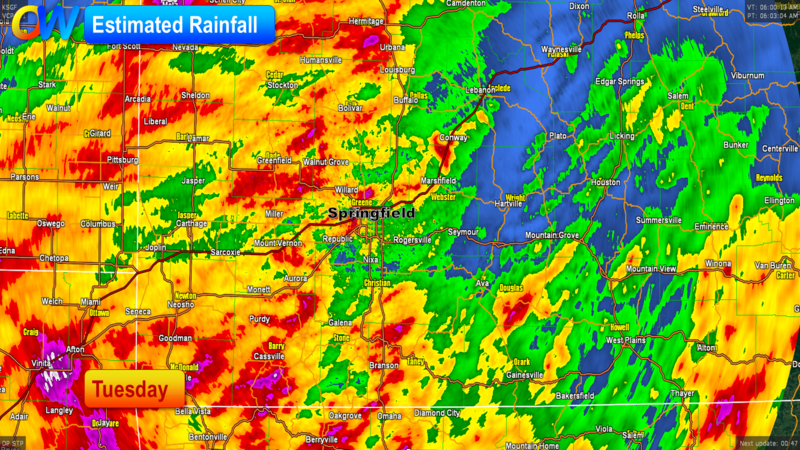 I’m forecasting the heaviest rain potential for areas just east of Springfield. Today’s front will be backed up by another on Friday which will keep our temperatures very comfortable through the weekend. Except for today, I think highs will stay in the seventies for the remainder of the extended forecast. Low temperatures will drop close to the upper forties by the weekend. High temperatures right around ninety will be the ticket for the rest of the work-week and into the Labor Day weekend. 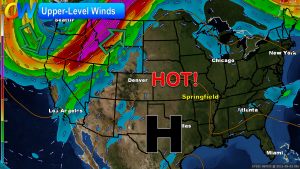 An area of high pressure at the jet stream level has built itself into the central U.S., allowing for a steady flow of out of the south at the surface and preventing cool fronts from approaching the area. 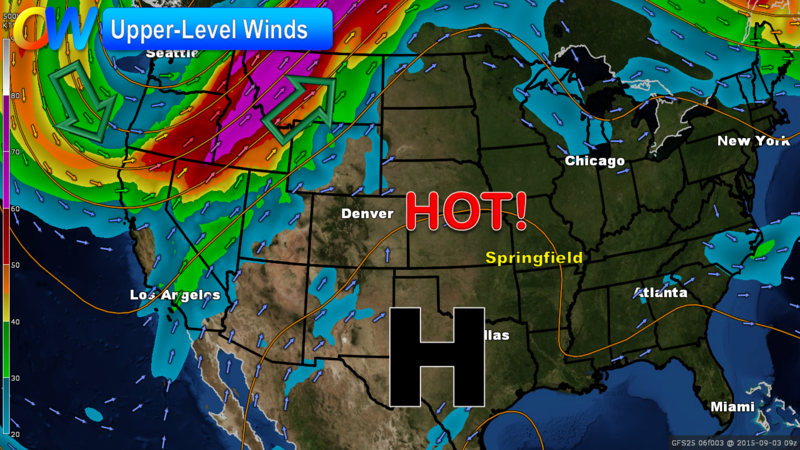 Therefore, a steady diet of daily highs around ninety is in the forecast through Sunday. This wind-flow will begin to change on Labor Day Monday as a cool front drops into the area. Showers and storms will begin to pop up in the area once again. This threat for rain lasts into much of next week. Temperatures will cool next week. 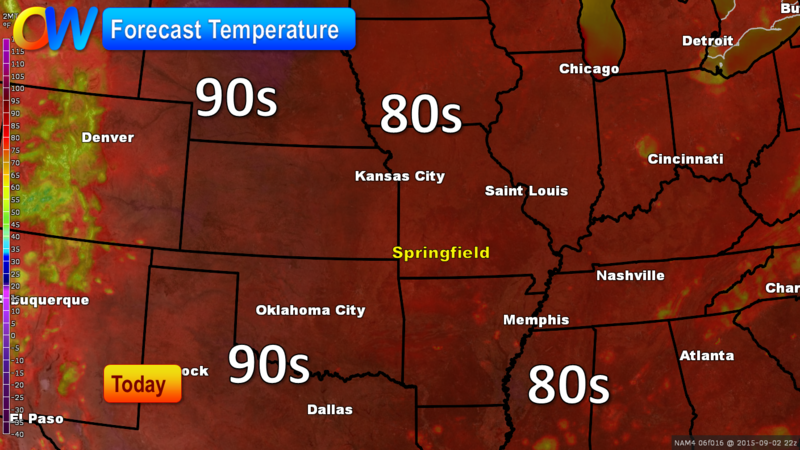 Eventually, the Ozarks will see high temperatures back in the seventies by the middle of next week. 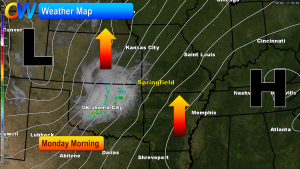 The Ozarks are locked into a breezy, warm and humid pattern of weather from now through the weekend. Our average highs will be right around ninety-degrees for the rest of the week with no sign of rain in the forecast. This warmth is on the heels of a cool August in Springfield where temperatures averaged a tad more than three degrees below the 30 year normal. Labor Day weekend is coming up and the start of it looks warm and humid. 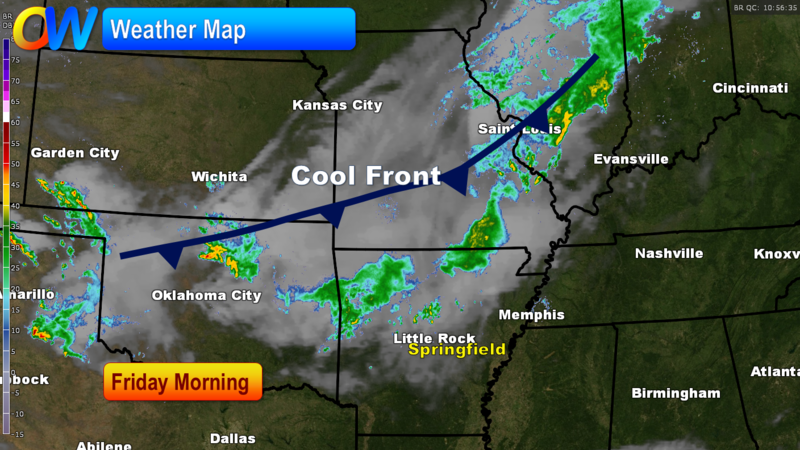 By Labor day Monday, a cool front starts to affect our weather with shower and storm possibilities.